While the insect threats for the season are on the decline, there may be a couple instances when bertha armyworm, grasshoppers or rare cases high lygus numbers require a late season pesticide. Always remember to first consult economic thresholds and look for beneficial insect predation or parasitism before considering an insecticide application. Next, pre-harvest intervals (PHIs), the time between spraying and swathing or straight combining, should be considered. 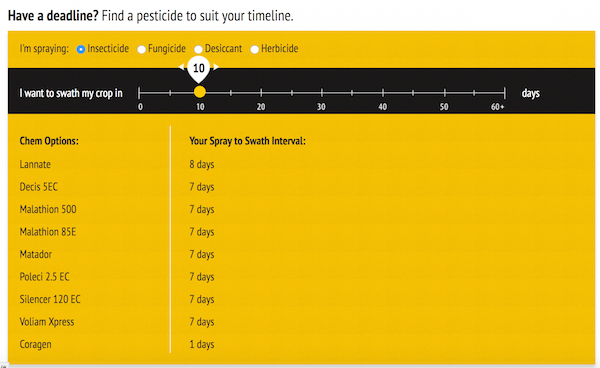 To quickly and easily check canola PHIs, use the interactive tool at spraytoswath.ca, which covers herbicides and desiccants in addition to insecticides and fungicides. Pesticides applied after the pre-harvest interval could leave traces on canola seed, and those traces can be detected along the transportation route (either by local elevators or at port) or worse, by the end user. One shipment that tests high for pesticide residue will have an immediate cost, in that the ship may have to bring the load home or re-route it, and likely a long term cost in terms of added testing and potential delays to re-access that market. Growers as well as applicators have a responsibility to know and follow pre-harvest intervals for all products.